Wouldn’t it be wonderful to know what vacuum cleaner is worth your money before you made the purchase? I could not agree more! So, with that in mind I decided to help consumers like myself purchase a vacuum cleaner that is worth their time and money. How did I do this? I spent endless hours searching and scouring information, reviews and other details concerning these handy floor cleaners. After my tireless research I found that the Hoover Quick Up Cordless 2 in 1 is an amazing machine that any household can benefit from. Eureka QuickUp Cordless 2-in-1 Stick And Handheld Vacuum is a diamond in the rough of best handheld vacuums and best cordless vacuums. What Is So Great About The Eureka Quick Up Cordless 2-in-1 Stick And Handheld Vacuum? If you are like me, money is always an object to consider before purchasing anything. Vacuum cleaners can be very expensive in many cases, however the Eureka Quick Up is an affordable choice! A price tag of around $40 is to be expected with this machine. Amazon has the best price on the cleaner. The Quick Up is a cordless vacuum cleaner. This means there are no cords to get in the way of a clean floor, nor any worry of finding a power outlet in which to plug up. You can literally take the vacuum anywhere that you want to go! And, at less than 4 pounds it is lightweight enough for anyone to easily move the vacuum from one location to the next. The lightweight design and compact size also make it ideal for storing even when there isn’t a lot of spare room inside of your home. You might think that a cordless stick vac that weighs only 4 pounds cannot do any real work, but that is not the case with the Eureka Quick Up. 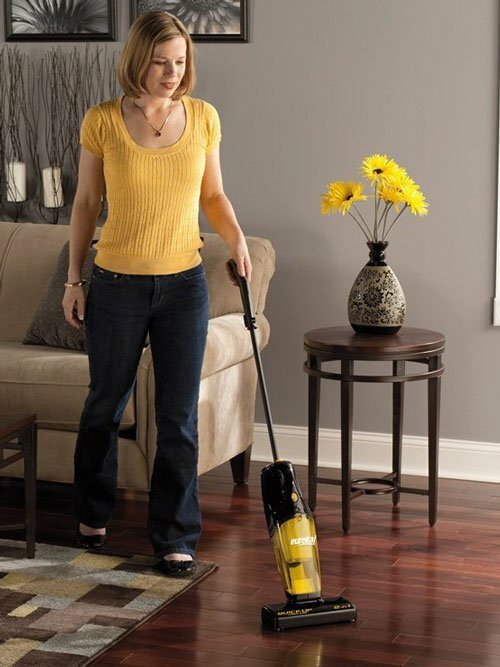 Ideal for small spaces and quick cleanups, the powerful vacuum takes care of dirt and grime like you would not believe. The handle on the Quick Up can easily be removed so that you have a handheld vac. This lovely features helps you clean most anywhere you want to clean, including inside of your vehicle. It takes just one push of a button to remove the handle and turn your vacuum into a handheld device. It is so simple even a child can do it! The fact that this vacuum cleaner stands upright is another plus. When it is time to put away you can do so with ease. Simply stick it in the closet and forget about it! It stands on its own so there are no worries left behind. There is an on/off brushroll included in the vacuum. One switch and you can easily pick up dust and other allergens from your floors, whether it is a bare floor or carpet. You can even clean upholstery and curtains with the QuickUp! You will find the Eureka QuickUp powered with a 6V motor. This motor may seem small but once you see it in action you’ll understand why it is such a popular choice for consumers. It quickly sweeps up all dirt and debris, leaving you with a beautifully clean home in no time at all. The microfiltration system is yet another excellent feature of this vacuum cleaner. This protects you from dirt and allergens. The HEPA filter ensures that even those with allergies and asthma can use the cleaner without any problems. The dust cup must be cleaned regularly. Although it is not clear and you’ll need to take it off to see when it is full, it takes just one easy push of a button to do. The dust keep ensures that all of the dirt and debris that has been collected stays in the cup where it is supped to be and far away from your face. As you can see there is plenty of things to love about this vacuum cleaner. And, these features only begin to break the surface. If you want a vacuum that quickly takes care of messes, there is no better choice. When you purchase the Eureka QuickUp Stick vac you receive a one-year warranty. This warranty offers replacement or repair at no cost should your machine malfunction. You are protected against both labor and parts with this one-year warranty. In order to put this warranty into effect you’ll need to fill out the product registration card that comes inside of the box. Amazon shoppers gave this vacuum cleaner a 4.2 out of 5 stars. Most all individuals who purchased the cleaner were amazed at what such a small vacuum cleaner could do. One person stated that she’d never seen anything like it while another stated that the cleaner is one of the best quick-ups she’s ever owned. Other people say they love how easy it is to use the vacuum as well as the amazing 2 in 1 feature. Check out these additional reviews of the Eureka 2-1 Cordless QuickUp Stick Vac and you’ll see why this cleaner is clearly a winner. You can read these reviews as well as many others when you click here. You’ll be taken directly to Amazon so that you can read these reviews. But, before you read the reviews, prepare yourself. You may not be expecting such amazing words from a vacuum so small and compact. You are hooked, right? Now it is time to add this fabulous vacuum cleaner to your life! A quick click here and you can find the Eureka Corldess Quick Up Stick vac at the best price on Amazon. Along with an amazing price for the machine you will also find the free shipping a definite plus. When you are searching for a vacuum cleaner that is affordable, lightweight and really takes care of the job there is no better choice than the Eureka Quick Up 2-1 Cordless Stick vac. It takes care of all of the hard work so you can get on with life and enjoy the fun things that you want to do.